With the Strictly Come Dancersize DVD selling 450,000 copies, and Living TV commissioning a series called “Strictly Come Dieting”, ballroom is clearly the new keep fit, so come dancing with Strictly Step-by-Step instead of joining a gym in January. 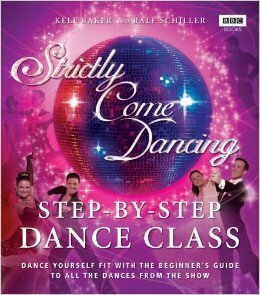 This easy-to-follow and fun introduction to the ballroom and Latin dances featured on “Strictly Come Dancing” is ideal for beginners teaching themselves to dance, or for those with more skill who would like to practice at home. For each dance, a brief history offers some background context, helping to set the mood. Then Strictly’s professional couples Erin and Anton and Darren and Lilia demonstrate the key moves, and on the following pages practical footprint diagrams showing the male and female steps, with illustrations of the upper-body hold, map out the dance in detail to complete the home tutorial.